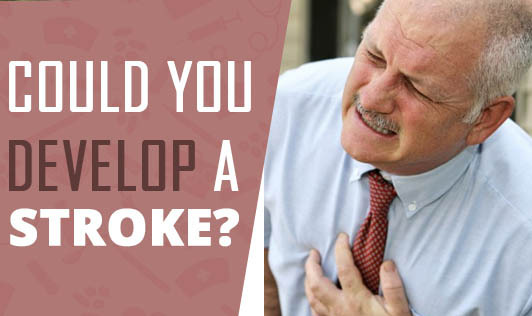 Could You Develop a Stroke? A stroke is a life-threatening medical condition that occurs due to the deprivation of blood flow to the brain. It can happen at any point in a person’s lifetime, from infancy to adulthood. High blood pressure- persistently elevated high blood pressure puts an extra strain on the arterial wall and over time this raises the risk of blood vessels becoming blocked or bursting which can cause a stroke. Diabetes- persistently elevated blood glucose levels contribute to the formation of clots or plaques in blood vessels. If these deposits stick to the wall of blood vessels or if they grow, can cause a narrowing or complete blockage of blood vessels which can cause a disturbance in blood flow to your brain and can lead to stroke. Heart disease- atrial fibrillation, heart failure, inborn heart defects, ischemic heart disease, and cardiomyopathy can disturbance in smooth blood flow and formation of clots that can lead to stroke. High cholesterol level- high level of cholesterol in your blood can cause formation and deposition of waxy material in your arteries which make the arteries narrowed and stiff, making it harder for blood to flow and further can cause the stroke. Brain aneurysm- brain aneurysm is a bulge in an artery in the brain and also a weak area that has the potential to burst or rupture. This ruptured aneurysm can cause a stroke. Beside above mentioned medical risk factor stroke can also be caused by smoking, alcohol consumption, use of the illicit drug, physical inactivity, unhealthy diet, stress, depression and by side effect of certain medication. So. adopt a healthy lifestyle and keep yourself away from a stroke.